The Welsh county of Ceredigion is a wonderful place to enjoy a short break, away from the hustle and bustle of home. Its award-winning beaches, picturesque towns and villages and stunning Cambrian Mountains are a huge draw for many families and couples. There’s lots of activities to try too, from golf and angling to watersports and horse riding. You’ll need somewhere luxurious to rest your head at the end of the day – like our Ceredigion holiday cottages. We’ve handpicked every property, so it’s guaranteed you’ll have an incredible stay. Fitted with modern facilities and boasting incredible locations, this is a unique experience you won’t forget anytime soon. Your search returned 1 matching property. First of all the location was fantastic - loved Aberporth the beaches and scenery stunning. This is the 7th Rural Retreats home I've stayed in over the years and so far all the homes have been outstanding - however this home was OK, but not up to normal standards. House is looking tired and in need of a makeover, slightly old fashioned and the furniture does need replacing - not the most comfortable sofas or bed. 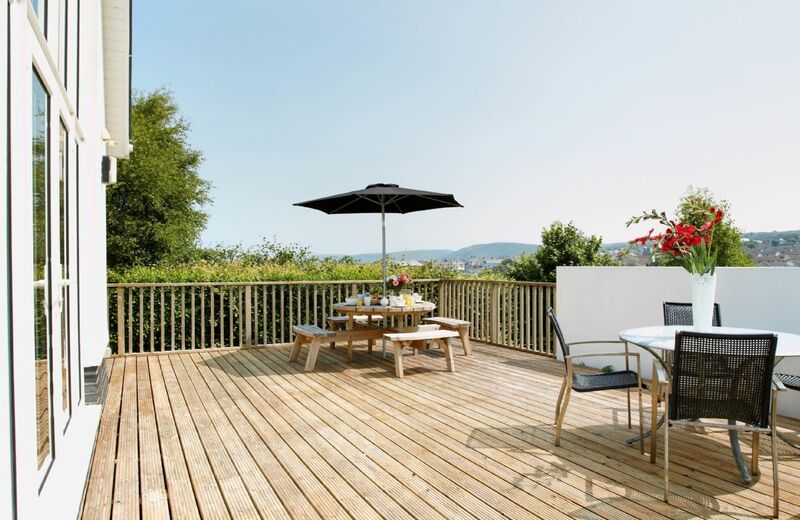 In addition - the photos used to showcase the location must have been done with a wide screen lens - the decking and driveway looked a lot smaller in real life! Plus the back garden and hammock were not at all as anticipated. So - great place to visit but not the house I'd choose to stay in again. lovely house and location. some mould in bathrooms.....and an infestation of flies in the velux of upstairs en suite bathroom, which was a little scary. otherwise great and we had a wonderful stay, and would recommend. Beautiful property in a lovely setting. Perfect. Hamper & fruit much appreciated. See the comments above about venue. We have stayed at Plas Bach for a number of summers and have always found it excellent. We would suggest investment in a newer dishwasher and more consistent internet access. Lovely building, shame it can't make better use of the views to the beach. The only real letdown was not having the advertised hammock. The hamper was excellent and the place was lovely. The only criticism was the place had not been checked when it had been cleaned and someone had overlooked the bin in the kitchen which was rather dirty on the outside. Thank goodness for Dettol wipes!! Beautiful house and well located for beach which is a short walk away. Very clean and tidy and attention to detail. Excellent hamper. Lovely furnishings and extremely comfortable. Hope to return soon. A beautiful house with features such as the upstairs living area, the large living room window and the outdoor areas with views of the sea. A good mix of modern IKEA and more traditional features, it was comfortable and clean. Aberporth is a lovely seaside village with a good pub and access to the coastal path. trimmings, & although weather wild & windy the house gave a 'gem' beach-experience in midwinter:reflecting colors & shapes of nature by day & night; 5 min walk to the beach & bay coastal path, with an ambient,spacious interior. Short drive to Cardigan Town:craft shops & friendly cafes: the 'Glasto' of Wales (+local Tescos & Aldi). Overall Plas Bach's furnishings, design decor & welcome hamper tweeks reflected the warmth & hospitality of this lovely region. Highly recommended...no hesitation to re-book. 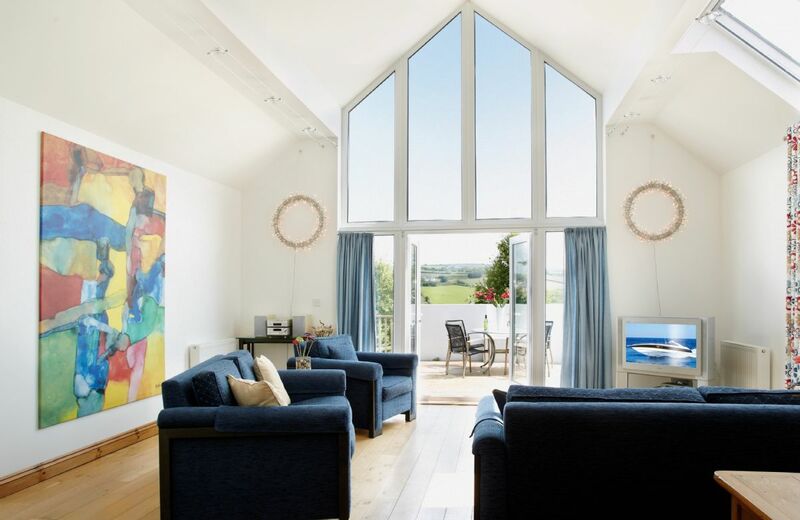 This modern, open-plan family-friendly house, in its own grounds, is in the picturesque village of Aberporth, Cardigan Bay, which boasts two Blue Flag sandy beaches. These are flanked by rock pools and are ideal for crabbing and swimming. For holidays taken between 20 April 2019 And 31 May 2019 Minimum of 3 nights booking.